Møbleret turisme klassificeret 3 stjerner. En Flassans-sur-Issole, i hjertet af departementet Var, nær Green Provence, på en hævet grund af egetræer og fyrretræer 7 400m2, huset har plads til 5 personer i et område på 100m2 stueetagen, ikke overset -til-VIS. Corner terrasse på 50m2 med pergola udvider stue og køkken. Den 11mx5m pool er stort set omgivet af en sikker hegn naturtræ vigepligt til et græsareal. Et ophold på 30m2 stue og spiseplads. 12m2 veranda. 11m2 udstyret køkken: 4 brænder (el / gas), opvaskemaskine, ovn, mikroovn. Fladskærms-tv, vaskemaskine, grill mulig udenfor højsæsonen. Havemøbler, solen. Fritid sport med Aoubré, naturparken træklatring, provencalsk landsby, vandreture, sommerens begivenheder. Byen Brignoles, kulturelle besøg med klostrene Celle og Thoronet, vinturisme med Provence-vinruten. 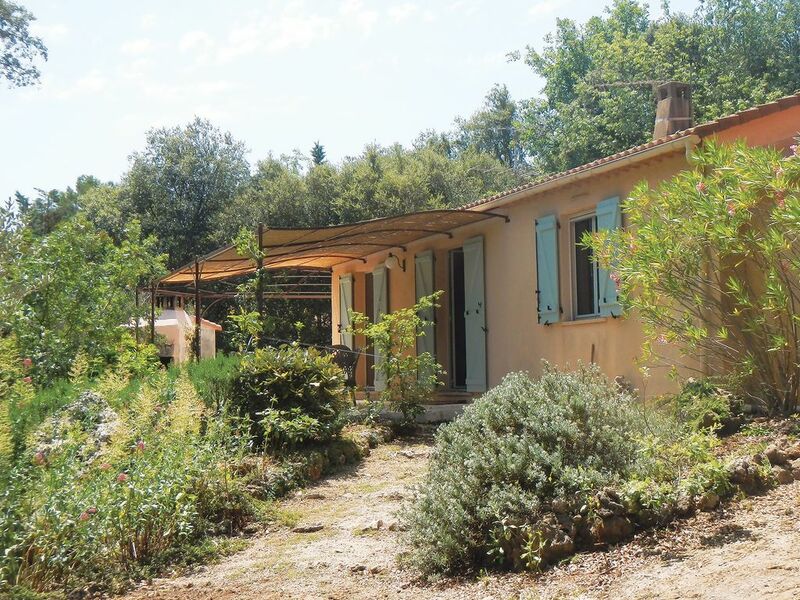 We have spent 14 days in this beautiful Provencal house and have only praise for it. The landlord is incredibly friendly and helpful and there were cold drinks when we arrived after a very long drive from Denmark. The house is located locally - a little up the mountain, but very undisturbed in a beautiful forest area. There is a large garden with flowers and beautifully covered terrace overlooking the garden and pool. The pool is large, clean and nice to lay by with 5 lovely sun loungers and other tables and chairs. Inside the house everything is functioning well and nothing is needed. It is very clean and smells nice. There are net and shutters for the windows, so you can sleep safely at night for insects with open windows. In the small town there are, for example. Bakery, butcher, grocery store, kiosk, cafes and flower shops and a little outside the city there is a large well-stocked shopping mall. Visit the great local wine shop, where you get the very tasty local wine. Just outside the door there are plenty of hiking and cycling routes and in the house you will find many brochures of tourist attractions. It is only 45 km. To the sea which we visited several times and we can recommend the beach area at Le Lavandou. This house lives up to what is written about it and we can only recommend it to others. I hope that the return to north has gone well. I'm so glad you found the activities and rest you were looking for. It was à real pleasure to welcome you. Wir haben im Sommer 2018 einen sehr schönen Urlaub bei Jacqueline verbracht. Sie hat uns sehr herzlich empfangen und uns alles erklärt. Das Haus ist ist wunderbar in einem großen Garten mit altem Baumbestand gelegen. Unsere zwei kleinen Kinder hatten oft großen Spaß, den Garten zu durchstreifen und aufgrund der Absperrung des Pools war es für uns aufsichtstechnisch sehr entspannend. Der Pool ist hervorragend, Wassertemperatur war konstant 28 Grad. Einziger Minuspunkt waren die Schnaken, welche uns abends auf der Terrasse doch arg zerstochen haben. Die Moskitonetze an den Fenstern waren aber sehr hilfreich, die Biester draußen zu halten. Alles in allem ein sehr gelungener Urlaub! À la prochaine! We had a very nice time during our stay in July. The house is very well equipped, with a real convenient pool. It is also well-kept with a elegant new bathroom. Every technical equipment worked properly and seems pretty new. There is only one little remark: The house offers 3 bedrooms. Two of them with beds which are not that comfortable for me, as I am a little taller then the average (197cm). But there are still remaining two beds for me. But in case your plan to stay there with a Basketball team... be aware of this. Nous avons passé un séjour très agréable en pleine nature. Une maison calme au milieu de la verdure, footing dans les vignes, baignades dans la piscine et promenades dans le massif des Maures ou au bord de la mer. Un accueil chaleureux qui vous donne envie de revenir. Nous conseillons vivement un séjour à Flassans. - Village Brignoles, "hovedstaden i Provence Verte"
A votre arrivée je vous demanderai un chèque de garantie de 500euros (que je n'encaisserai pas) que je vous restituerai à votre départ.